The Revolutionary War not only signified the separation of thirteen of the North American colonies from their mother country (Nova Scotia or New Scotland was the fourteenth colony, which never separated and served as a haven for some), it also resulted in two countries with unique philosophies about everything from politics and government, economics and commerce, philosophy and religion, science and medicine. The overlap that existed in many North American and Anglican traditions was about to change. The major instigators of this change were the geographical differences that existed between these two parts of the world. The United States was a much larger country, with differences in climate, weather, natural events and disasters that barely compared with the same for Great Britain. Along with these very important differences important to how we manage to survive in a given region were the very different physiographic, geologic, botanical and zoological differences defining our place in the local ecology. These differences were naturally what led to different opinions about what were the healthiest ways to live, what the best foods were, and in time, where the most healthiest places to stay were. The association of place and health and the requirements for staying or becoming healthy in a place superficially may have differed very little between the two countries located on completely different halves of the world. But due to the differences in diseases that then prevailed and the differences in their patterns of distribution and migration across the globe, there were at times opposing opinions as to the cause and effect in the Old World versus New World. These differences in opinion even became regional at times in North America, with philosophies on how to prevent disease different amongst coastlines versus more inland communities. With two different groups of doctors forming their local societies in New York and Philadelphia, differences in opinion were quite prevalent and argumentative at times, appearing regularly in the medical journals published by each. It is easy to understand and predict how and why people, including doctors and surgeons, residing in the tropical parts of the North American continent, had a set of opinions that at times differed from those of the temperate zones, with both of these sets of colonial or United States physicians adhering to a different set of beliefs from the Canadian physicians residing north of the thirteen colonies, but to understand the differences in opinions and philosophy that prevailed within the Mid-atlantic part of North America means we have to take a closer look at the personalities and beliefs underlying these two schools of thinking in early United States medical history. 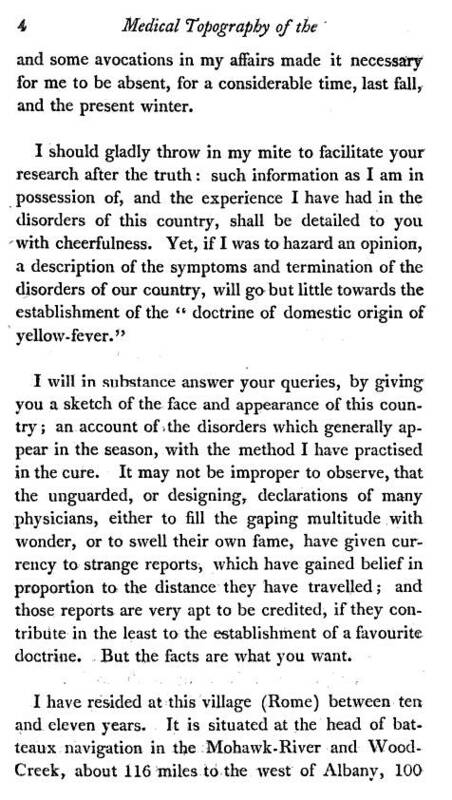 Prior to the arrival of yellow fever in recurring epidemic patterns in the United States following the Revolutionary war, it was just another of the many fevers physicians were trying to understand. During the colonial years, for example, fevers were interpreted by their patterns and the cyclicity of their periods of sweats, chills, hot flashes and ague. Complicating these temperature-physiological methods of interpreting fevers were the other distinct patterns that could be used to differentiate the typhus from the yellow fever and spotted fever, and each of these from the more periodic malaria and non-periodic or continuous febrile conditions. Likewise, an illness attached to a known fever type had its own defining features and seasonal behaviors. The continuous fever for example was more a brief winter or summer phenomenon, which today we might liken to a cold or flu. The cyclic fever patterns, be they remittent or intermittent, versus 1-, 2-, 3- or even 4-day ague, were typically related to malaria in some way shape or form. The typhus was normally a wintertime epidemic, and the yellow fever a late summer early autumn event, sometimes lasting into the late fall months. Spotted fever had as its telltale clues the symptoms it produced on the skin, as did the yellow fever, sometimes referred to as the black plague. 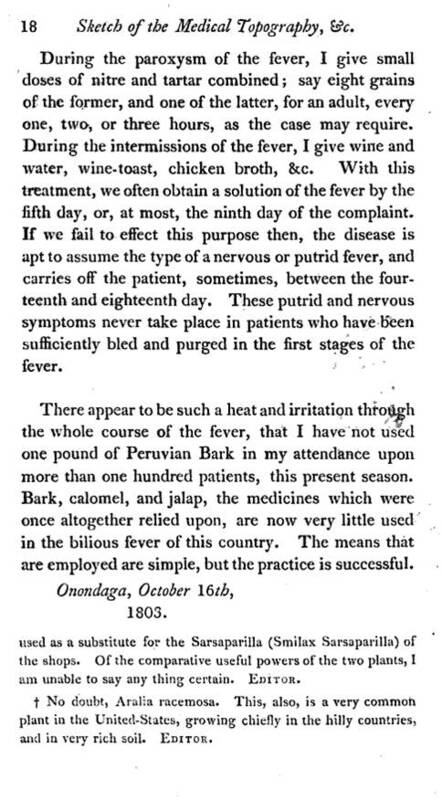 Whereas prior to during the Revolutionary war, the minimal knowledge about and lack of understanding of the fever led to a fairly regimental means for treating the fevers, the total change in philosophy of what could be causing the fevers as a result of the War itself completely reversed certain parts of this philosophy about disease and health, especially when it came to fevers. The process of life itself had a component to it that gave certain physiologists and physicians insight into the fever as a body’s response. One possible mechanism for life and vitality–the vital force–was heat. The living body was warm, the deceased body of a person, like the material of an object that never had a life, was cold, or of a temperature similar to its surroundings. For this reason there were vitalists (believers in vitalism and vital force) who had a tendency to accept the body and its alkaline-acidic nature and attached chemical mechanisms as a cause for this heat, and others who believed in the vital force as some form of energy, capable of moving about and at times leaving the body briefly or turning inactive or sedentery–a condition called suspended animation–only to return through a process known as re-animation and artificial respiration. Adding to this view of the vital force was Priestley’s interpretation of the respiratory process and the role of Oxygen in vitalizing the body of living beings. Accompanying the Oxygen theory was the phlogiston, a substance that removed life or extinguished it. Prior theories about phlogiston defined a theoretical substance that extinguished life. So long as the imagination needed was there, a cause for phlogiston could be identified and explained. For example, with Dr. and congressman Samuel Mitchell, there was a theory somewhere in the medical journals and books that would discuss a theoretical substance that could be the cause for life. Inferring the up and coming notion about spoilage and disease as being related through a new substance–septon–Mitchell was able to define poor antisepsis as a cause for diseases in putrid natural waste products and detritus, or the human caused putrescences (septon) produced human generated debris and waste, versus the contagious form of putrescence produced by and emitted directly from the ill body. During the late 1790s and early 1800s, the discovery of Carbon Dioxide led to a change of phlogiston theory to the precursor to the next great discovery in medicine–Oxygen. This brought the philosophy of this field back to a more chemical and materialistic based state of existence. This time phlogiston was a chemical, referred to as phlogiston at times (mostly by Mitchell’s colleagues) but more than likely only in jest. Mitchell’s septon theory for disease prevailed in New York, holding its own in competition with Pennsylvania’s Benjamin Rush’s various theories on infection and contagion, each with both remote and proximal causes. Both the septon and oxygen theory conflicted with the vital force theory, and the understanding of physiological processes. The most influential physical science findings for this time pertained to heat, and its possible role as a life force. 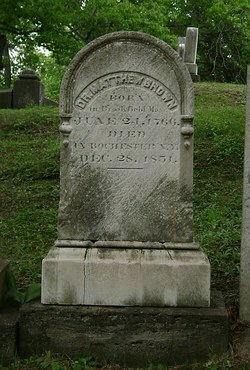 The ability of a living body to form heat measurable by a thermometer was very important around 1800, once the doctors trained in the Hudson Valley were required to know this new skill as a part of their oral licensure exam (Poughkeepsie Journal announcements to physicians’ apprentices advertise this). The physical world was very much in competition with the beliefs of metaphysicians between the very late 1790s and the early 1800s. Priestley’s theory of Oxygen won out during this time because it “grounded” physicians philosophically. This theory replaced the need for a possible equivalent to the vital force such as heat, light, electricity, magnetism and gravity. Oxygen was just another of nature’s elements, but one that was crucial to life. Accompanied by a number of new discoveries with electricity and galvanism, these theories set the stage for two fields of medical philosophy to develop–one devoted to the physical world and the other to some theological component of nature linked to the elan vital or vital force concept. It was the extreme behaviors of nature that at times that helped to give rise to certain diseases. Too much sun caused apoplexy. Too much cold causes catarrh (Colds) and Flus. Too much exposure to the elements at certain times of the year made us ill on a seasonal basis. Long periods of hot, intense summer climates made us emotional, cataleptic, or filled with rage. Travel to new places due to changes in weather and climate, elevation and temperatures, influenced the way we maintained our vital state. Some travellers became too hot, others sweated too much, others became emaciated and dehydrated, still others took the the illnesses these states produced–like the fever. Likewise, in 1806 one had just learned with certainty that electricity could revitalize the soul, bring the spirit back into the body of a deceased person. This discovery, promoted heavily by professors at Yale and Harvard and energized by the growing Quaker movement, enabled a humanitarian society to be formed–their goal was to engage in artifical respiration to revive someone of a state of suspended animation (both phrases their own terms). This meant that individuals who died from drowning or hypothermia were recovered in large numbers in the years to come. This association of the vital force with nature, and man’s diseases with migration patterns and the places mankind chose to live, accompanied by numerous scientific theories focused on physical theories for how diseases are produced, gave science and medicine the underlying philosophy needed to focus on nature and climate, topography and weather, as the important causes for disease. The endemic and epidemic theory was now coming into full force. The writings of geographers like Augustus Riverius, Frederick Hoffman and Johannes Christophorus Homann during the early 1700s (ca, 1720s) made it possible for the climate theory for disease to become center stage after the Revolutionary War. Whereas prior to the war, physicians were still often focusing on the person and body as the means for understanding disease, man’s exposure to the elements as the result of fighting during one of the coldest winters, made it possible for certain observations to be made which were then interpreted in terms of how nature defines people’s health. Wartime medicine also benefited from the War because it brought physicians from other countries into a single place to share their unique knowledge and experience for several years. This led to a more rapid sharing of knowledge and discoveries and enabled newer discoveries to be made with new conclusions to be drawn. 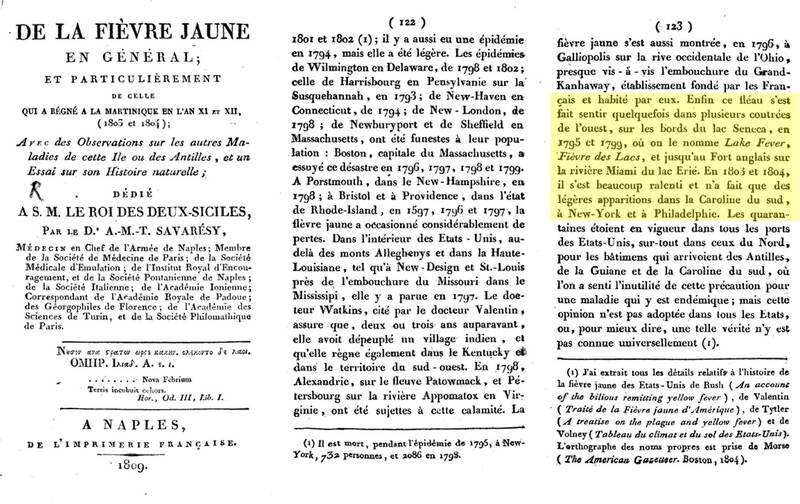 For the United States, wartime helped set the stage for the rapid development of new knowledge between 1776 and 1783, and again once the French Revolution resulted in many immigrations of French scholars between 1785 and 1800. All of this culminated in the development of a new medical topography and medical geography philosophy by 1795. The medical profession then began to define its goals and purpose based upon the observations and discoveries made by topographers, climatologists, and geographers, not just theoretical anatomists, physiologists, pathologists, and pharmacists. 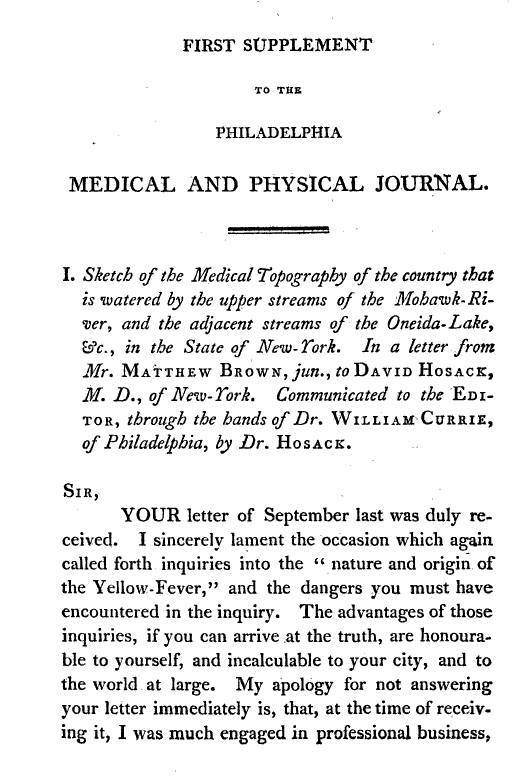 The publication of New York’s first medical journal Medical Repository began in 1797 with a forward stating to its readers the importance of topographical studies of health and disease. Its chief editor, physician and congressman Samuel Mitchell, was a strong believer in what we might refer to today as a regionalist interpretation of disease–claims that diseases can be very much related to their region and that people may or may not be adapted to these diseases due to their upbringing. Lamarckianism then ruled, not Darwinianism (which comes 50 years later), that is to say ‘You are a product of your surroundings, and have the ability to adapt to it and pass these adaptations on to your children.’ Our reaction to natural events and the inner makings of our physique and body define how we come in contact with and then develop and experience a disease state. Just prior to the publication of the first issue of Medical Repository came the first geographic disease patterns with a place name defined for them that was derived from a map. Such a practice would soon make the first such disease with a place name play a very complex role in American medical history and ultimately international medical history. 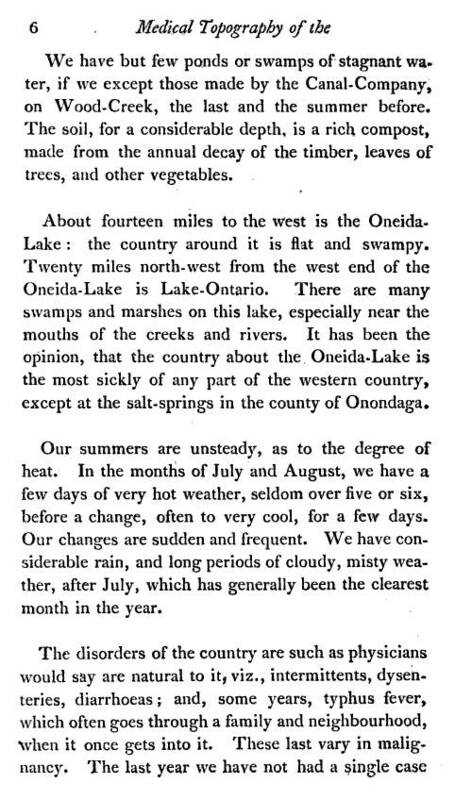 In 1792, “Genessee or Lake Fever” was defined for the first time. 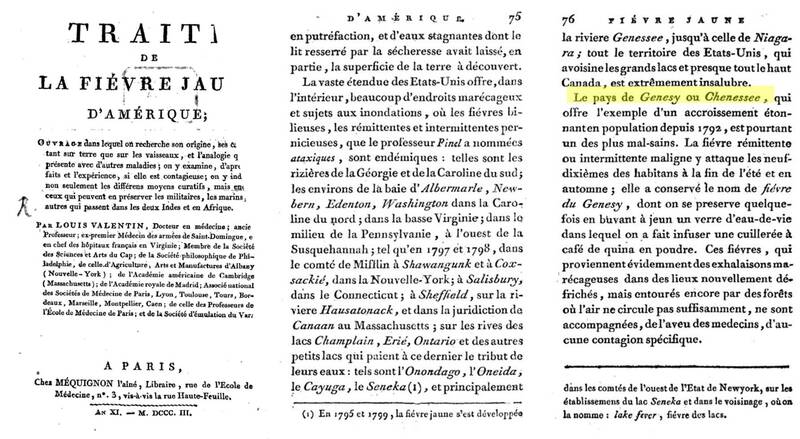 At first such a claim was contested, and in the upcoming years, a number of French writers referred to it in their discussions about the settlements in the Great Lakes region, noting the similarity in Lake Fever and the better known Yellow Fever. 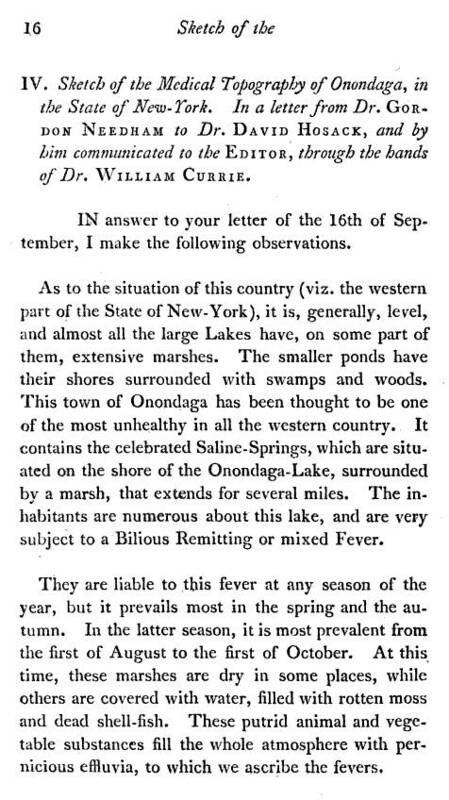 By 1798, the differentiation of Lake and Yellow Fever became a concern as yellow fever epidemics returned to the ports along the Atlantic shores, resulting in the moral medical, philosophical and politically motivated question–Was this epidemic diseaes making its way into western New York as a source of contagion on board ships, or was it simply a more commonly noted disease that was endemic to western New York? 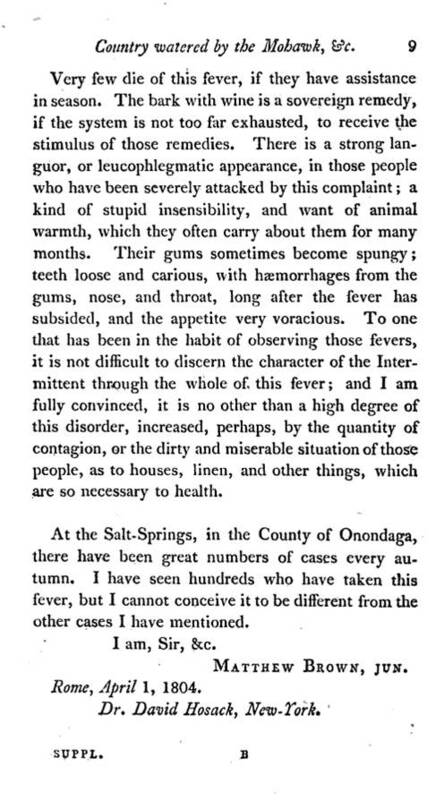 In 1799, word was out that the more northern and inner portions of New York were showing signs of epidemics. Some writers were claiming it was nothing more than the bilious fever already described in a series of articles about the Philadelphia and New York city epidemics. 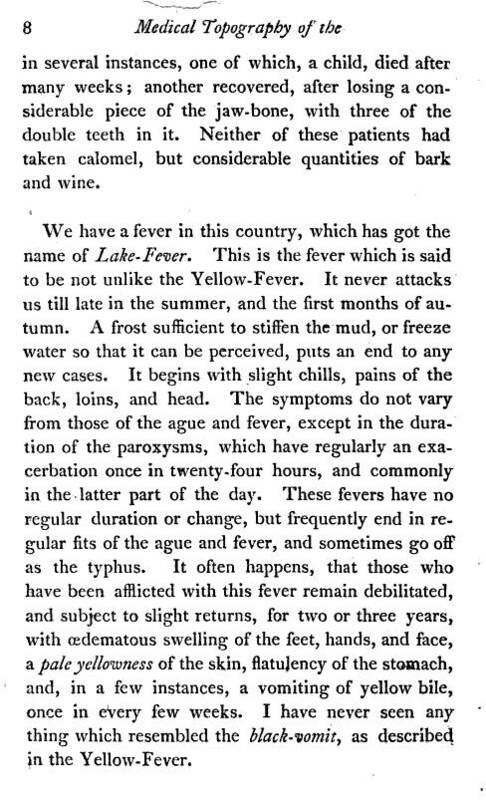 One author wrote the Gentleman’s Farmer claiming that the yellow fever and new and mysterious lake fever were no different. But in lower New York, plans to settle western New York could be impacted by such claims, and so the locally popular theory for miasma-induced lake fever remained popular to the articles on this new contagtion published in New York . From 1800 to 1806, yellow fever was a recurring event. It’s tremendous impact on civilians in Philadelphia during 1797 demonstrated a fatality previously unmatched by any North American epidemic diseases. Five years later, as this region became further settled, religious claims as to its cause became common and even mass hysteria like behaviors set in at times as the onslaught of a new epidemic reminded everybody about the history of the plague and its Biblical meaning. 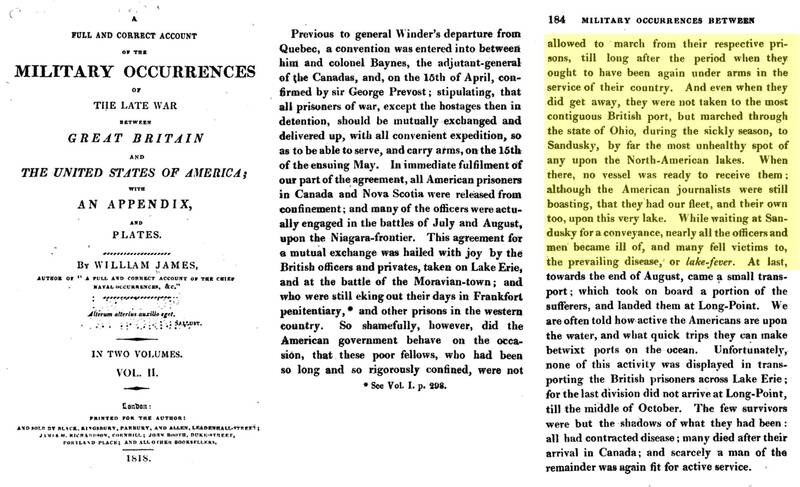 When the War of 1812 commenced, the British who were originally against the invention of such a disease, now heavily popularized by American writers, made the claim that this fever was the cause for the poor health British-Canadian prisoners experienced after being captured during war near the Canadian border. 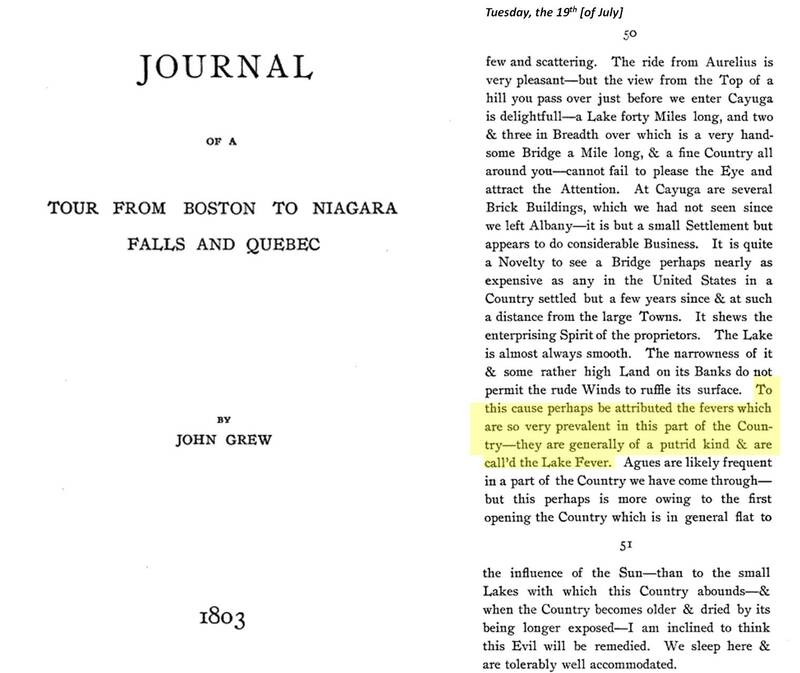 Now the use of a place name like “Lake Fever” appeared to finally be in vogue for the British, at least when such a need for this excuse arose. Summary of contents of these articles. 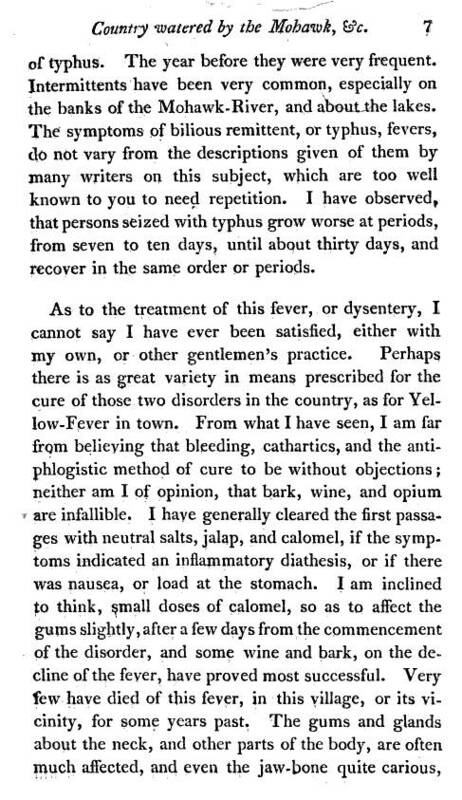 Matthew writes this letter right after the first few years of the religious and scientific arguments regarding the yellow fever commenced. Quarantine has by now been pretty much successful in some cases, for about five years. So the shipborn ability of yellow fever to spread is now well documented and known. Brown’s article is a request for the study of a part of New York that ten years later he and Colonel Nathaniel Rochester would begin plans to settle and establish a new society with. Concurrent with this rise in medical geography interest was the development of the field of epidemiology, as demonstrated by the establishment of quarantine practices and development of new statistical methods for tracking and analyzing natural events. The first medical associations to develop in the United States were regional and developed in order to monitor local disease patterns. As a par tof these required early disease surveillacne procedures, regional repoorts on medical topography were required by the Governor, for states participating in these medical advancements. The following three articles exemplify the impact of this change in medical philosophy and teachings. Important to note here are several important pieces of history relevant to this period in time. 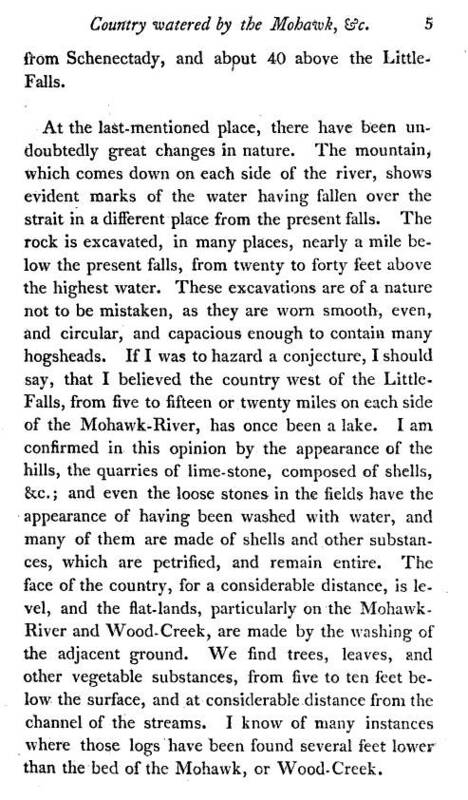 First, the heart of medical geography was formed and passed along the Hudson River up to the Mohawk, and it was the early observations of climate, weather, topography and other natural features and events in this part of New York that led to the development of newer interpretations in future years for this period in early American medical history. The medical geography of the Hudson and Mohawk rivers, and the County of Onondaga and its neighboring lands, counties and communities in the Finger Lakes region defined this field of science and medicine for the 1800 to 1825 medical geographers. Second, this is a continuation of an earlier developed theory of geosophy (wikipedia has this part of the history of geosophy missing, which is interpreted as a more metaphysical, and pre-/post-modern, newdarwinian, philosophy of place term). 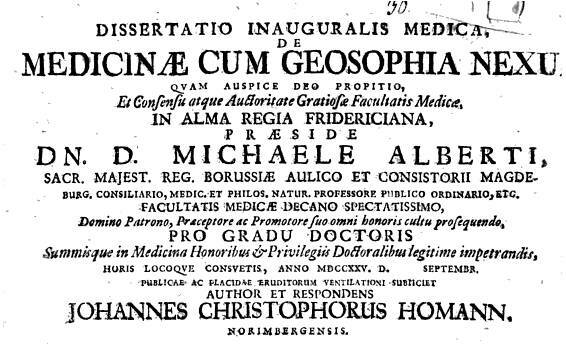 This term was used by Homann in his 1729 dissertation on the value of geography as a subject of medicine. Homann defined the geography of medicine as important due to the relationships between disease and climate, disease and topography, and the association of medicines and their natural occurance in certain disease regions due to this spatial relationship (to use a more modern term for this latitude-longitude relationship). Homann himself claims to base this philosophy on the writings and teachings of Riverius and Hoffmann. Third, the article boneset published in association with these two medical geography articles is perhaps not coincidental. The use of this locally grown United States plant had all the medical geography and geosophical requirements for being the best medicine for treating fevers around this time. Over the next decade this association of boneset with treating fevers, both related to the same place, defined geosophy as an important profession and gave new thinkers and new version of natural philosophy to work with other than the traditional, very Biblical, natural theological concepts promoted in religious classes. This philosophy, although given a name and definition by Homann, is also theological in form and history as well, as suggested by many of the “First Impressions” I review on another blog page. Several pages later in this issue, another brief article appears on western New York medical geography, as follows. This is reviewed in detail on another page. The introduction of boneset to the American materia medica began sometime in the late 1700s, probably following the Revolutionary War, and probably took place in the either New York, New Jersey, Pennsylvania, Massachusetts, or Connecticut. No detailed story could be found for the initial observation and documentation in writing of this plant as a fever remedy prior to the Revolutionary War period as well as immediately following the war. 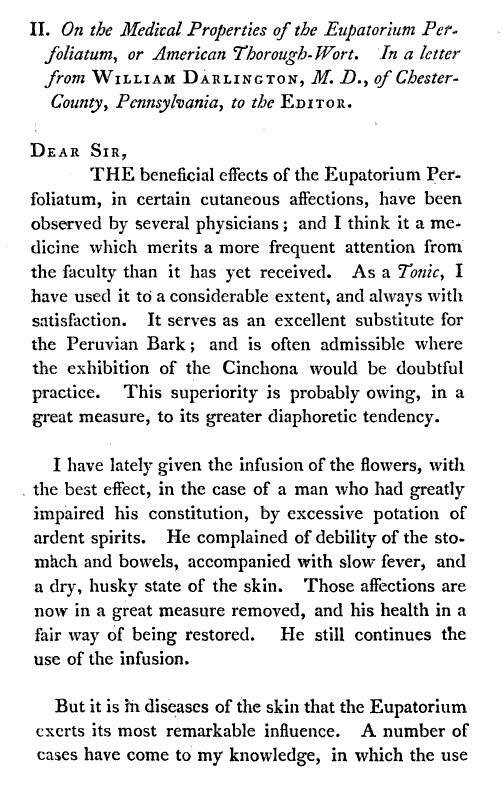 Some of the earliest botany essays perhaps mention it, as a local plant with some general reference to possible remedial use, but no detailed description is seen detailing how and why it came to be used for treating fever. The use of this plant for treating fevers was developed during the yellow fever epidemic years of U.S. history. The common name boneset” for this plant refers to its perceived value in treating a particular form of fever known as breakbone fever, a common name used for the dengue fever, which had a similar ecological behavior in early Colonial and United States history. 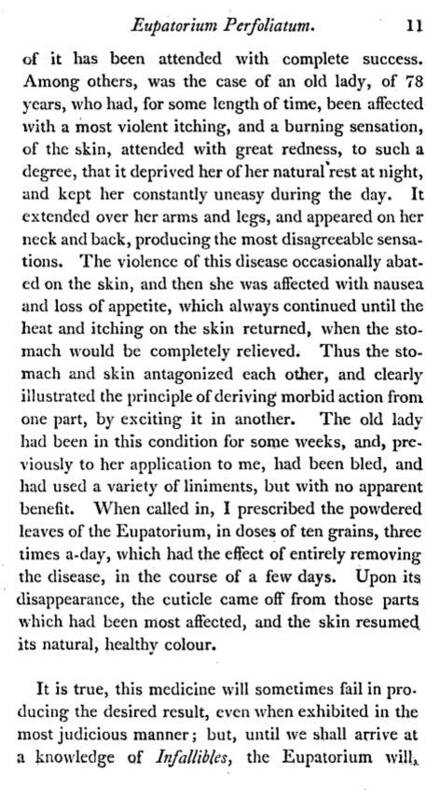 By 1800, the presence of breakbone fever was apparently well documented in U.S. history, but again, the exact initiation of this use of boneset to treating breakbone fever is not easy to find adequate documentation for. A close relative of this plant, “Joe Pye weed” (Eupatorium purpureum) has a similar ethnobotany history and overlapping medicinal values. Only a little more is known about the origins of the uses for this plant, with some evidence found in contemporary herbal medicine books stating that the name “Joe Pye” is actually from “Jopi”, the name used by a native American or descendent thereof using this plant during the Indian Doctoring period, probably ca. 1790 to 1810, but perhaps earlier. 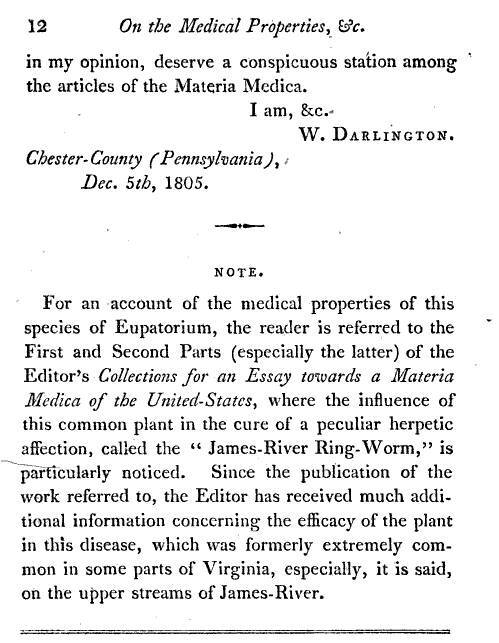 The following 1806 article details the uses of this plant. This type of documentation of the local herbal medicine has been term “heroic” doctoring by past medical historians. It is very much a consequence of someone learning the Native American use for a plant, and then learning the philosophical and medical reasoning for this utilizations, and then modifying the theory somewhat (something I call ‘transformation of common belief’) or redefining the use of the plant through practical personal experience. This article comes at an important time in medical botany history. In England, the reasons for the effectiveness of Digitalis on someone with edema (heart failure) has for the first time been documented by William Withering as being a benefit of the toxicity of this plant. A contemporary of Withering, John Darlington, was well known for his botanical illustrations. The relationship between the author of this article William Darlington, and the famous botanist John Darlington, is uncertain. The above history of pathology and disease theories in general suggest that physicians were now talking hold of numerous theories regarding the cause for disease. We often learn about disease causality arguments as the supporters versus the non-supporters, like the contagionists versus non-contagionists. But there were also the animalculists versus non-animalculists, the vital force believers (i.e. Dr. Thomas Gale, Troy) versus the non-believers (Dr. James Livingston Van Kleeck, Poughkeepsie), the medical electricians (i.e. Caleb Child, Poughkeepsie) versus the non-electricians for this time, and the pro-septon (New York’s Samuel Mitchell supporters) versus anti-septonists (Philadelphia’s Rush followers). The primary arguments always pertained to how physicians differentiated the details of diseases based on causality. In the end, the best physician had multiple philosophies to base his practice upon–some dsieases were considered contagious, others brought on by infectiousness and poor sanitation, and still others induced on by toxins, such as the venom of a snake or the leaf of a poison ivy. Another very important feature of this article is the author’s use of a place name to identify a disease. This was probably old hat and very much colloquial or folklorish in nature during the decades prior, but now, there was some evidence for a scientific reasoning unlying the proposal for such a name. “Jame-River Ring-Worm” relates a particular disease to a specific place. It refers to an illness that is animalcule based, with that organisms recognized as having its own live force or energy, and an exceptionally significant power against the good health of people due to its vitality. 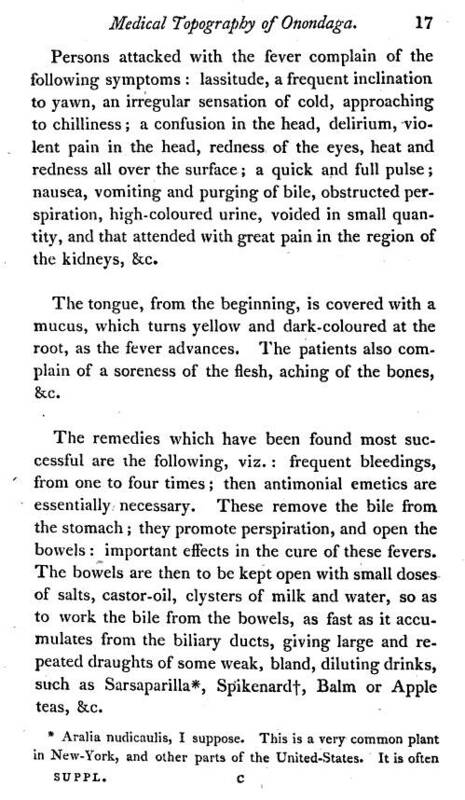 These are all concepts barely touched upon in the medical theory writings prior to 1790. In the North Carolina area, a similar finding of an animalcule was made between 1799 and 1802, when a physician documented a small almost microscopic worm as the cause for certain farm animal diseases. The lay person believed in “the Worm Theory” for disease as evidence by newspaper and magazine advertisements on cures for the same. 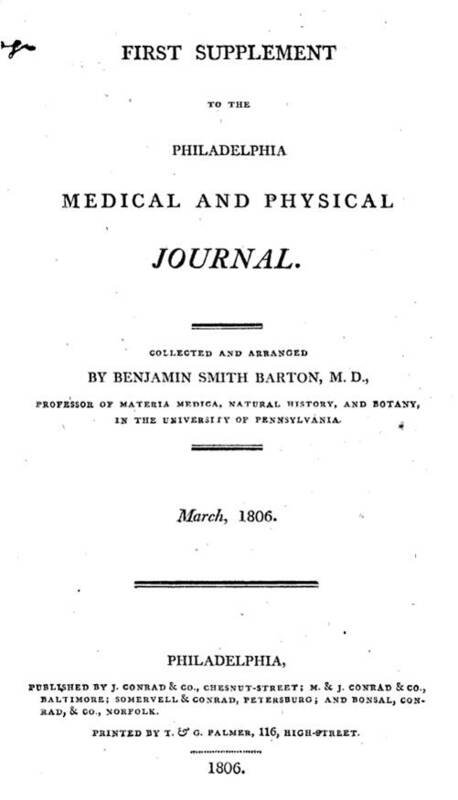 Benjamin Smith Barton’s Collections for an Essay towards a Materia Medica of the United States, published multiple years between 1800 and 1810, is to be reviewed elsewhere. I was reading through some of your articles on this site and I believe this website is real informative! Keep putting up.